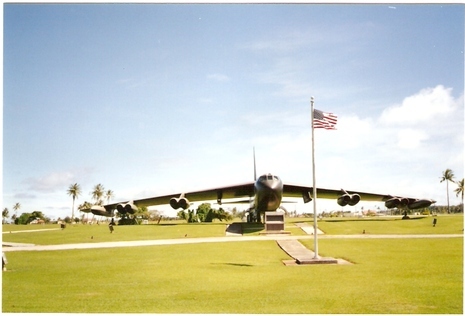 Operation Arc Light was the 1965 deployment of B-52F Stratofortress as conventional bombers from bases in the US to Guam. By extension, Arc light, and sometimes Arclight, is the code name and general term for the use of B-52 Stratofortress as a CAS platform to support ground tactical operations assisted by ground-control-radar detachments of the 1CEG during the Vietnam War. In 1964, the U.S. Air Force began to train strategic bomber crews in the delivery of conventional munitions. Under Project Big Belly, all B-52Ds were modified so that they could carry nearly 30 tons of conventional bombs. B-52s were deployed to air force bases in Guam and Thailand. Arc light operations were most often close air support bombing raids of enemy base camps, troops concentrations, and/or supply lines. The first use of these heavy bombers in Southeast Asia occurred on 18 June 1965. Flying out of Andersen Air Force Base, Guam, twenty-seven aircraft used 750 and 1,000 pound bombs to attack a Viet Cong stronghold. During this mission two B-52Fs were lost in a mid-air collision; another was unable to conduct air refueling. Missions were commonly flown in three-plane formations known as "cells" and were also employed when ground units in heavy combat requested fire support. Releasing their bombs from 30,000 feet, the B-52s could neither be seen nor heard from the ground as they inflicted horrific damage. B-52s were instrumental in nearly wiping out enemy concentrations besieging Khe Sanh in 1968 and An Loc and Kontum in 1972. Arc Light missions continued until the cessation of hostilities by all U.S. forces on August 15, 1973. Between June 1965 and August 1973, 126,615 B-52 sorties were flown over Southeast Asia. During those operations, the U.S. Air Force lost 31 B-52s: 18 from hostile fire over North Vietnam and 13 from operational causes. 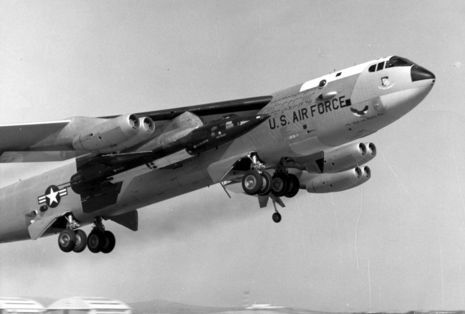 The first B-52 Arc Light bombing mission was carried out on 18 June 1965. On this mission, 27 B-52F bombers of the 7th and 320th Bombardment Wings based at Guam were used to attack a Viet Cong jungle redoubt with conventional 750-pound and 1,000-pound bombs. 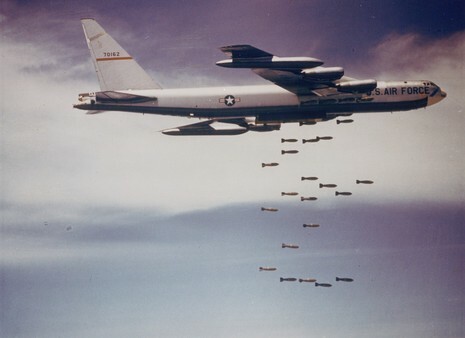 General William C. Westmoreland, commander of U.S. forces in South Vietnam, was convinced the B-52 could play an effective role in defeating the North, and he called for more bombing missions. From June through December, the 7th, 320th, and 454th Bombardment Wings completed over 100 missions to South Vietnam. These B-52s were used primarily in saturation bombing of Viet Cong base areas, but later they were used in direct tactical support of the Marine Corps’ Operation Harvest Moon and the First Cavalry Division’s fight in the Ia Drang Valley.